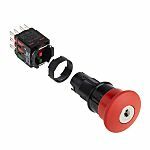 An emergency stop push button is a fail-safe control switch that provides both safety for the machinery and for the person using the machinery. The purpose of the emergency push button is to stop the machinery quickly when there is a risk of injury or the workflow requires stopping. All machinery requires an emergency top button unless it would not reduce the risk or the machine is hand operated. The buttons are red as standard, often with a yellow background. Push-pull: The button is pushed in to stop and released by pulling the button back. Twist release: The button is pushed in to stop and released by twisting the button. Key release: The button is pushed in to stop and only released with a key. 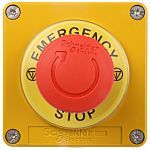 Emergency stop push buttons can be found in any industry including industrial, commercial and public facilities. They are required to be clearly visible to anyone that is required to use them. It is also possible to have several emergency stop buttons on one machine depending on what part of the machine has to be stopped. Foot and palm buttons have a large actuator surface and are also tamper-proof. They can be actuated by using the foot or hand and their simple design makes for a quick response. 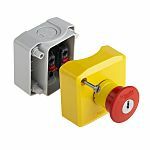 These types of emergency stop switches are ideal for harsh environment applications. Position switches provide a link to the emergency stop actuating element. This type of emergency stop button is highly reliable plus quick and easy to fit. They can also be used in a wide range of applications.